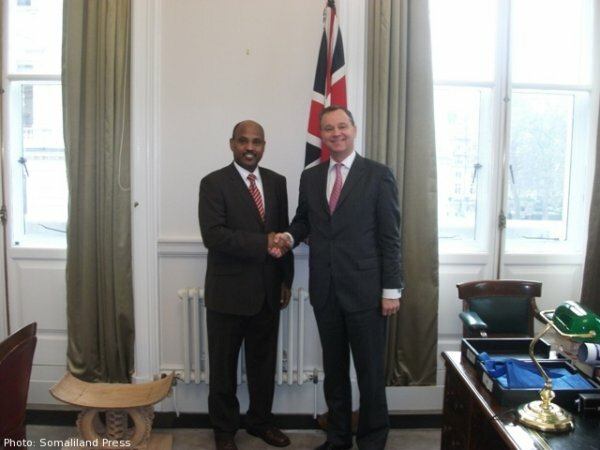 Somaliland’s Foreign Minister, Dr Mohamed Omar, hails Somaliland-UK ties at a meeting in London with British Minister for Africa, Mark Simmonds. The Minister of Foreign Affairs of the Republic of Somaliland, Dr Mohamed Omar, has met with the UK Minister of Africa, Mr Mark Simmonds MP, at the Foreign & Commonwealth Office in London on 3 January . Dr Omar took the opportunity to brief the Minister about Somaliland’s recent local elections, which showed the Somaliland people’s commitment to peace and democracy. He thanked the Minister for the generous assistance, which the UK is providing to Somaliland, including the contribution to the Somaliland Trust Fund, help with the security sector, and support for the elections. Expressing gratitude for the UK’s help in facilitating the Somaliland/Somalia Dialogue, Dr Omar stated that Somaliland was ready to resume the talks now that President Hasan Sheikh had established his Government in Mogadishu. Dr Omar also emphasized Somaliland’s commitment to fighting piracy and terrorism in the Horn of Africa. Minister Simmonds confirmed Britain’s commitment to support Somaliland development and democratic achievements and expressed that The UK will be happy to facilitate the dialogue between Somaliland and Somalia when the two sides are ready to resume talks. The two ministers also discussed how to promote trade and investment ties between the UK and Somaliland. Finally, Minister Omar invited Mr Simmonds to visit Hargeisa to see Somaliland for himself.